A distinction is made between physical (or "physics-based") models and mathematical models, both of which are addressed in this book. Physical models pertain to theoretical or conceptual representations of the physical processes occurring within the ocean; the term "analytical model" is sometimes used synonymously. Mathematical models include both empirical models (those based on observations) and numerical models (those based on mathematical representations of the governing physics). The subject of analog modeling, which is defined here as controlled acoustic experimentation in water tanks employing appropriate oceanic scaling factors, is not addressed in this book. Barkhatov (1968) and Zornig (1979) have presented detailed reviews of acoustic analog modeling. The physical models underlying the numerical models have been well known for some time. 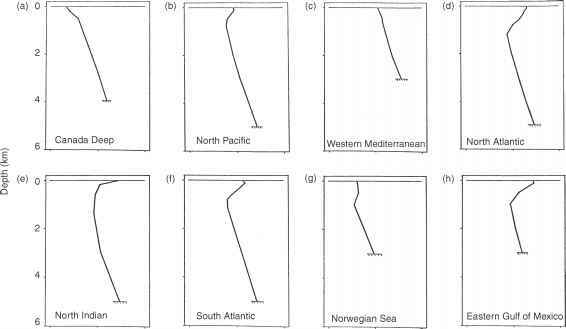 Nevertheless, the transition to operational computer models has been hampered by several factors: limitations in computer capabilities, inefficient mathematical methods and inadequate oceanographic and acoustic data with which to initialize and evaluate models. Despite continuing advances in computational power, the development of more efficient mathematical methods and the dramatic growth in databases, the emergence of increasingly sophisticated models continues to challenge available resources. This book addresses three broad types of underwater acoustic models: environmental models, basic acoustic models and sonar performance models. The first category - environmental models - includes empirical algorithms that are used to quantify the boundary conditions (surface and bottom) and volumetric effects of the ocean environment. Such models include, for example, sound speed, absorption coefficients, surface and bottom reflection losses and surface, bottom and volume backscattering strengths. The second category - basic acoustic models - comprises propagation (transmission loss), noise and reverberation models. This category is the primary focus of attention in this book. 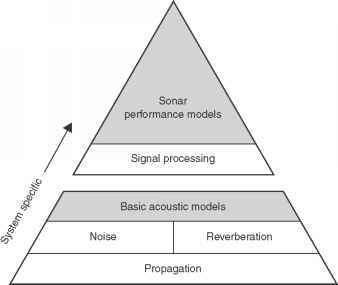 The third category - sonar performance models - is composed of environmental models, basic acoustic models and appropriate signal processing models. Sonar performance models are organized to solve specific sonar-applications problems such as submarine detection, mine hunting, torpedo homing and bathymetric sounding. Figure 1.1 Generalized relationships among environmental models, basic acoustic models and sonar performance models. Figure 1.1 illustrates the relationships among these three broad categories of models. As the applications become more and more system specific (i.e. as one progresses from environmental models toward sonar performance models), the respective models become less universal in application. This is a consequence of the fact that system-specific characteristics embedded in the higher-level models (e.g. signal processing models) restrict their utility to particular sonar systems. Thus, while one propagation model may enjoy a wide variety of applications, any particular sonar performance model is, by design, limited to a relatively small class of well-defined sonar problems. The wide breadth of material covered in this book precludes exhaustive discussions of all existing underwater acoustic models. Accordingly, only selected models, considered to be representative of each of the three broad categories, will be explored in greater detail. However, comprehensive summary tables identify all known basic acoustic models and sonar performance models. These tables also contain brief technical descriptions of each model together with pertinent references to the literature. Notable environmental models are identified and discussed in appropriate sections throughout this book. Modeling applications will generally fall into one of two basic areas: research or operational. Research-oriented applications are conducted in laboratory environments where accuracy is important and computer time is not a critical factor. Examples of research applications include sonar system design and field experiment planning. Operationally oriented applications are conducted as field activities, including fleet operations at sea and sonar system training ashore. Operational applications generally require rapid execution, often under demanding conditions; moreover, modeling accuracy may be subordinate to processing speed.